"At this time, a decision has not been made on how the Commission [Alberta Human Rights Commission] will proceed with this matter." "The Commission is bound by the decision of the Court of Appeal [which] directs that the matter will go back to the Tribunal to be heard by a new Tribunal." "[Our own Charter rights were violated in that the tribunal] failed to differentiate between private and public schools and failed to appreciate that freedom of conscience and religion is assessed differently between the two." "Public schools have a duty of neutrality, private schools do not." "[Webber Academy is] a highly respected school, consistently ranking as a top school in Alberta." "Dr. Nazar testified she asked Dr. Webber if the students could pray in the garage outside, in a corridor, in the basement, behind some trees or even in a closet. Dr. Webber answered no, and said that they must go off the school premises." "If there was a blizzard outside or if it was too cold to pray, Mr. Sisddique testified that he and Mr. Amir would find a nook or cranny and pray. He felt that this was humiliating." "The amount of space required for the Muslim prayer as described here is only slightly larger than the space occupied by a person." "We welcome students and families of all faiths and beliefs, but we think it's fundamental to our families and students that this be an educational institution where no religious practices are allowed,"
"We were thrilled to hear today with the decision of the Alberta Court of Appeal with respect to us not having prayer space in our school for any religion and this really supports our position from the beginning at this school where we are going to be a non-denominational, secular school where we welcome all students from all religious backgrounds and cultures which we have here." Two Muslim teens were banned from performing their daily prayers where they had been enrolled, at a private, non-denominational high school, in Calgary. Webber Academy has about a thousand students enrolled from kindergarten to grade 12. Founded by Neil Webber, a retired professor and former provincial cabinet minister in Calgary in 1997, the boys enrolled originally in 2011, were first assured they would be permitted to pray within the school in empty classrooms with the permission of teachers. That permission was later reversed, and the two boys,14-year-old Naman Siddique and Sarmad Amir, also 14, in grades 9 and 10 were informed the school would no longer permit them to perform their daily prayers which involved a ritual of standing and kneeling. The school informed the boys' mothers, Shabnam Nazar and Farhat Amir of the change in authority, and the mothers appealed to no avail. They then turned to the province's Human Rights Commission which set a tribunal and found, in 2015 that the school had discriminated against the two on the grounds of religious belief. Mr. Webber's wife Barbara, vice-president of administration, informed Naman Siddique as he prayed in the library that he was forbidden to do so and in so doing "contributed to a sense of shame and humiliation developing in this 14-year-old student", according to the tribunal. Despite being informed they could no longer pray in school premises the boys persisted until they were finally discharged from the school, deposit cheques for the following year returned. Speaking before the tribunal, Neil Webber "testified he was concerned that there was a 'plan' to force Webber Academy to provide prayer space", failing to impress the tribunal which dismissed his concern. An "overt" Muslim prayer sequence involving a traditional ceremony was simply not acceptable to the secular nature of the school, he testified. That the boys indulged in prayer as their faith required by lying prostrate on knees with hands before them while reciting Koranic passages and other prayers simply did not reflect the school's values. A lower court judge dismissed the school's appeal while noting that "Webber Academy, to its credit, adopted a public policy of welcoming young people of many faiths and cultures, and to exemplify its policy, published photographs of students with turbans and facial hair even though these practices contravened usual school policies. For some reason, it drew the line at [Islamic] Sunni prayer rituals, conducted in private, in a place that was convenient to the school and the students from time to time." 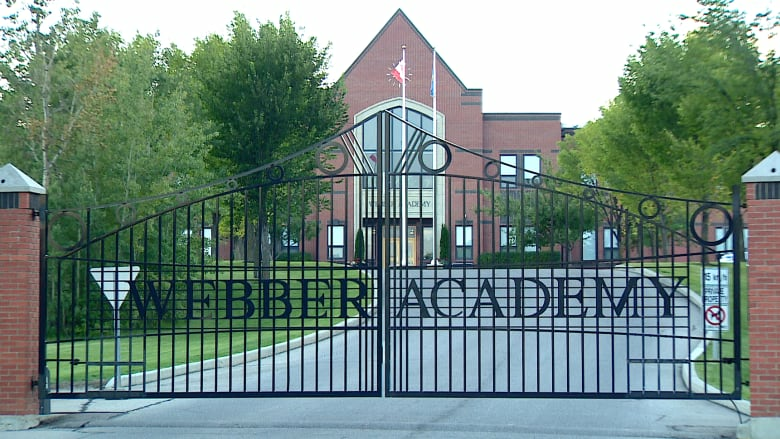 The Human Rights Commission in 2015 ruled in favour of the families, handing down a $26,000 fine against Webber Academy. Which spurred the school to go to the Alberta Court of Appeal which overturned the ruling, citing errors in the decision by the tribunal. As well, the appeal judges stated that in their opinion the students were given ample time to schedule prayer outside of school hours. The two families decided to turn to the Supreme Court of Canada, which in turn declined to hear an appeal. Leaving the Alberta Court of Appeal's ruling on the matter the final word from the courts that had volleyed the case right back to the Human Rights Commission, calling on it to settle the case by calling another tribunal or simply setting it aside. Another tribunal would face the same complaints as the original heard, but would be pressed to pay attention to new issues as ordered by the Alberta Court of Appeal. There is no shortage of parochial Islamic schools available to Muslim students to attend where their prayer time is guaranteed.